$10.00 off per person with cash payment! Cancellations made within 72 hours of sail will be charged a 100% cancellation fee. No-Shows will be charged a 100% cancellation fee. Your Mad Max Adventure sets sail from our new marina dock on beautiful Edgartown Harbor. Historically, Edgartown (then known as Great Harbor) was a primary port for the whaling industry during the 1800s. From our decks, there are spectacular views of the whaling captains’ houses and classic yachts that line the waterfront. This is a town that was meant to be explored from the water! 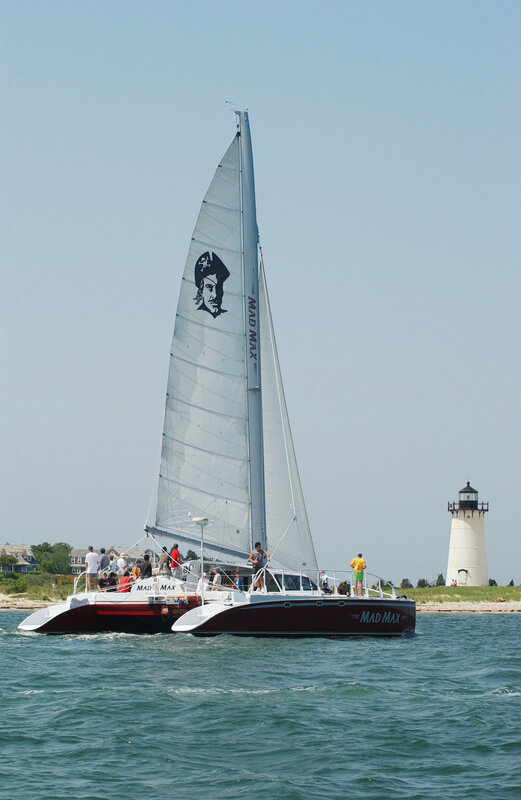 Our sail begins as we pass the Edgartown Lighthouse, through the Outer Harbor, and into the tranquil blue waters of Nantucket Sound where motor yachts, sailboats, and fishing vessels are seen traveling between Cape Cod, Martha's Vineyard, and Nantucket. Here the wind direction will determine our course! One route may take us along the sandy shores of Chappaquiddick Island towards Cape Pogue Lighthouse; another past the colorful town of Oak Bluffs with its quaint gingerbread cottages, ferry port and jetty-bound harbor. Our Evening Sail times our re-entry into Edgartown harbor as day turns into night behind Edgartown Lighthouse. Between the light and the view, it is gorgeous opportunity for a photo you will always treasure! Guests aboard the Mad Max can enjoy the sun, wind, and water while riding on the spacious decks or relax in the comfort of our shaded cabin. Mad Max is fully equipped with tables and seats, restrooms, and all required U.S.C.G. safety equipment. Our knowledgeable Captains and Crew are dedicated to your safety and comfort, and our 20 plus years in the business insures it. Guests are welcome to bring along snacks & refreshments (BYOB).